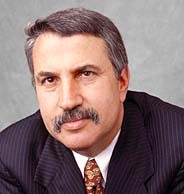 Thomas L. Friedman won the 2001 Pulitzer Prize for commentary (his third Pulitzer for The New York Times). He became the paper's foreign-affairs columnist in 1995. Previously, he served as chief economic correspondent in the Washington bureau and before that he was the chief White House correspondent. Recently, I've had the chance to travel around the country and do some call-in radio shows, during which the question of Iraq has come up often. And here's what I can report from a totally unscientific sample: Don't believe the polls that a majority of Americans favor a military strike against Iraq. It's just not true. It's also not true that the public is solidly against taking on Saddam Hussein. What is true is that most Americans are perplexed. The most oft-asked question I heard was some variation of: "How come all of a sudden we have to launch a war against Saddam? I realize that he's thumbed his nose at the U.N., and he has dangerous weapons, but he's never threatened us, and, if he does, couldn't we just vaporize him? What worries me are Osama and the terrorists still out there." That's where I think most Americans are at. Deep down they believe that Saddam is "deterrable." That is, he does not threaten the U.S. and he never has, because he has been deterred the way Russia, China and North Korea have been. He knows that if he even hints at threatening us, we will destroy him. Saddam has always been homicidal, not suicidal. Indeed, he has spent a lifetime perfecting the art of survival — because he loves life more than he hates us. No, what worries Americans are not the deterrables like Saddam. What worries them are the "undeterrables" — the kind of young Arab-Muslim men who hit us on 9/11, and are still lurking. Americans would pay virtually any price to eliminate the threat from the undeterrables — the terrorists who hate us more than they love their own lives, and therefore cannot be deterred. I share this view, which is why I think the Iraq debate is upside down. Most strategists insist that the reason we must go into Iraq — and the only reason — is to get rid of its weapons of mass destruction, not regime change and democracy building. I disagree. I think the chances of Saddam being willing, or able, to use a weapon of mass destruction against us are being exaggerated. What terrifies me is the prospect of another 9/11 — in my mall, in my airport or in my downtown — triggered by angry young Muslims, motivated by some pseudo-religious radicalism cooked up in a mosque in Saudi Arabia, Egypt or Pakistan. And I believe that the only way to begin defusing that threat is by changing the context in which these young men grow up — namely all the Arab-Muslim states that are failing at modernity and have become an engine for producing undeterrables. So I am for invading Iraq only if we think that doing so can bring about regime change and democratization. Because what the Arab world desperately needs is a model that works — a progressive Arab regime that by its sheer existence would create pressure and inspiration for gradual democratization and modernization around the region. I have no illusions about how difficult it would be to democratize a fractious Iraq. It would be a huge, long, costly task — if it is doable at all, and I am not embarrassed to say that I don't know if it is. All I know is that it's the most important task worth doing and worth debating. Because only by helping the Arabs gradually change their context — a context now dominated by anti-democratic regimes and anti-modernist religious leaders and educators — are we going to break the engine that is producing one generation after another of undeterrables. These undeterrables are young men who are full of rage, because they are raised with a view of Islam as the most perfect form of monotheism, but they look around their home countries and see widespread poverty, ignorance and repression. And they are humiliated by it, humiliated by the contrast with the West and how it makes them feel, and it is this humiliation — this poverty of dignity — that drives them to suicidal revenge. The quest for dignity is a powerful force in human relations. Closing that dignity gap is a decades-long project. We can help, but it can succeed only if people there have the will. But maybe that's what we're starting to see. Look at how Palestinian legislators just voted no confidence in Arafat; look at how some courageous Arab thinkers produced an Arab Human Development Report, which declared that the Arab-Muslim world was backward because of its deficits of freedom, modern education and women's empowerment. If we don't find some way to help these countries reverse these deficits now — while access to smaller and smaller nuclear weapons is still limited — their young, angry undeterrables will blow us up long before Saddam ever does.